Get up close and personal with wild dolphins off the coast of Australia on this exciting tour from Perth. You’ll cruise around small islands and into sheltered bays from Rockingham, a 40-minute drive from Perth, to interact with dolphins in their natural habitat. Snorkeling equipment is provided, and you’ll enjoy the experience with a knowledgeable crew that has befriended more than 200 local dolphins over many years. Their familiarity provides you with a very memorable day on the Indian Ocean. Enjoy a family-friendly day on the water! When booking, select the option that corresponds to your pickup location: a meeting spot in Perth, central Perth hotels or Rockingham, 40 minutes south of the city. If departing Perth, your tour starts with the coach drive to Rockingham, where you’ll hop aboard your custom-built ‘dolphin swim’ boat that features a large platform for easy access in and out of the water. Set off from the shore with the boat crew, who locates a pod of dolphins while you put on your provided wetsuit, snorkel and mask. Then jump in the water and marvel at the dolphins who quickly surround you, ready to swim with you and show off their playful antics. 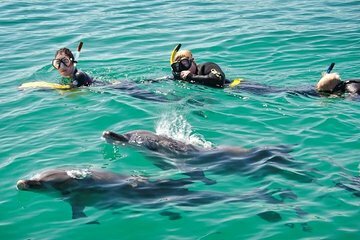 While swim-with-dolphin opportunities can be found at many beach resorts in Australia and around the world, this tour provides a superior experience due to the staff, who has built a rapport with these beloved marine mammals. It’ll be the highlight of your time in Perth. When you get out of the water, refuel with provided refreshments on the boat before returning to Rockingham, where your tour ends with the drive back to Perth. IT was awsome to See dolphins in their natural environment!! I can 100% recommend it!! If you really wanna see dolphins, book this trip instead of going to the zoo or aquarium!! Support this organisation, the team was so kind and they told really interesting knowledge about this special animals!! They also try their best, that you can see the animals in a good way, close and many times!! Everyone had numerous encounters with multiple dolphins. We were able to see a ~ 3 week old infant with mom and an older calf. There was no feeding of the dolphins, only curiosity on their part! The guides were very friendly and new a lot about individual dolphins and their habitat. Great day on the ocean! Once in a lifetime experience to spend time with wild dolphins. Suitable for all ages, I went with my husband and teenage boys and we all agreed this was the highlight of our WA trip. The crews passion for dolphins is genuine along with their desire for you to share their joy. Very profesional!!! Absolutely amazing!!! I cannot recommend this tour enough!! An absolutely amazing experience that must be done! Such a great day and the team were excellent. Absolutely loved this tour. Have been on dolphin swimming tour before but never got so close to dolphins as on this trip. There were so many of them and we had so much time swimming with them. Heaps of food, warm tea, wetsuits, even a towel, and snacks were provided. This is a MUST DO when in Perth!! Good service, friendly, good reception. The trip far exceeded my expectations. I didn't realise how many dolphins there were or how close you actually got to them. It is just you, a snorkel and a dolphin next to you absolutely amazing. The trip is really well managed, the staff are clearly well trained and are very helpful.The tour organisers have clearly put a lot of thought into the trip as shown by the nice touches like the warm shower on the boat which came in really handy as the sea was quite cold. The staff were really keen to give us as many opportunities to swim with the Dolphins as possible. Once a pod moved we would move the boat to find another and jumped straight back in the water. I want to say a personal thanks to Will, Kameika and JT for one of the best days I've had. I loved everything about the morning we spent with swimming with wild dolphins. Beautiful day, the guide was punctual, the crew was nice and very easy to connect with, great group. We saw dolphins at our first stop already. It's important to be aware of the fact that they are wild. Don't expect to touch a dolphin or playing with them. It's all about observing them in their natural habitat. I guess we were in the water about five times for a couple of minutes each. Last time we were in, we could watch the dolphins eating some fishes which they caught with help of a sting ray. We even got free pictures sent to us by e-mail.